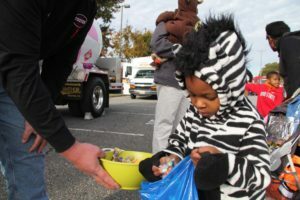 Numerous public safety and local company vehicles joined in the Halloween festivities this past Saturday, Oct. 31st for Trunk or Treat in Lynchburg. Fire trucks, police cars, ambulances, county sheriff vehicles, and of course our Foster Fuels pink propane truck filled up the front Brookville High School parking lot from 9:00 am to noon to give children with special needs and their families an opportunity to spend Halloween in a safe and fun environment. Dressed in their best Halloween costumes, the kids explored each vehicle, met the drivers, received treats including candy and coloring book pages, and even enjoyed a hayride around the school. Thank you to everyone that participated in the event. Celebrate Halloween with us at Trunk or Treat! Hosted this year at Brookville High School, this free event is meant to give special needs children and adults an opportunity to participate in a fun and unique Halloween experience. 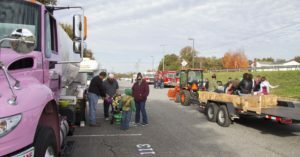 From 9:00 am to 12:00 pm on October 31st, enjoy handout treats for the kids and climb in and explore numerous public safety vehicles from the Campbell County Sheriff’s Office, the Campbell County Public Safety, Lynchburg PD, tow trucks, our Foster Fuels truck and more! Bring the whole family and join us at this family friendly event. fosterfuels has written 119 posts. How Do Temperature Changes Affect Propane? I am glad I chose Foster Fuels and have been very pleased with the service. Keep up the great work!